First generation scarlet oak sawfly (Caliroa quercuscoccineae) larvae are beginning to skeletonize oak leaves in southwest Ohio. The larvae are currently in the 1st and 2nd instar stages and a little less than 1/8" long. Despite this sawfly's common name, larvae may be found feeding on a wide range of oaks including pin, black, red, and white oaks as well as its namesake oak. The odd-looking larvae have semi-transparent bodies that are flattened towards the front and tapered towards the back. The larvae coat themselves in a slimy exudate that is thought to be produced by glands near their head. Research suggests the sticky slime allows the larvae to adhere to the underside of leaves where they feed. The slimy coating makes larvae glisten in the sun. Their shape coupled with their shimmering coating gives rise to the alternative common name of oak slug sawfly. There are six instar stages with instars 1 – 5 looking almost identical except for their gradual increase in size. However, 6th instar larvae develop two peculiar black markings on their anterior end that makes them look like they are wearing sunglasses. All larval instars feed gregariously side-by-side on the lower leaf surface consuming everything except for the veins and upper leaf epidermis. Feeding patterns may appear as longitudinal stripes, fans, or circular patterns. Initially, the upper epidermis has a faded, whitish appearance. Eventually the epidermis dries out, turns brown, and drops from the leaf leaving behind the veins to produce the characteristic skeletonizing symptom associated with this sawfly. The sawfly spends the winter as 6th larvae inside cocoons in the leaf litter. Development is completed in the spring. Once the black, fly-like females are mated, they use their saw-like ovipositors to insert eggs in rows along major leaf veins. There are 2 - 3 generations per season in Ohio; consequently, damage tends to escalate as the season progresses. Thus far, the first generation populations I've come across in southwest Ohio appear to be small and randomly scattered. 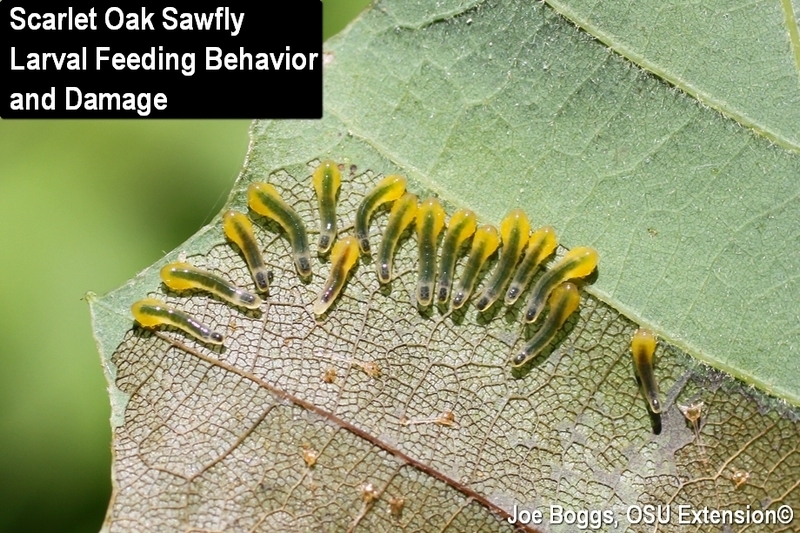 However, populations of each succeeding generation should be closely monitored because this sawfly has a history of producing significant defoliation on oaks in Ohio forests and landscapes. Heavy defoliation of oaks occurred during “outbreaks” of this native sawfly in southern Ohio in 1997 and 1998. In 2011, Erik Draper (OSU Extension, Geauga County) reported heavy defoliation of oaks in the northeast part of the state. However, as is common with native general defoliators, years with high populations are usually followed by many years with almost no evidence of leaf damage allowing trees to recover without the aid of insecticides to suppress sawfly populations. Indeed, southern Ohio has not experienced widespread defoliation from this sawfly since 1998 and no significant tree loss was associated with that outbreak.